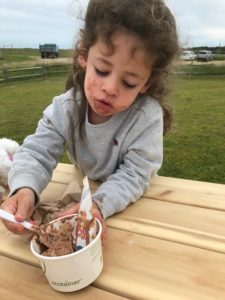 Calling Ice Cream Fans of All Ages! Home DafaultThe Farm Dirt BlogAround The FarmCalling Ice Cream Fans of All Ages! Who doesn’t love chocolate ice cream? It was as if the weather knew we were opening an ice cream stand! 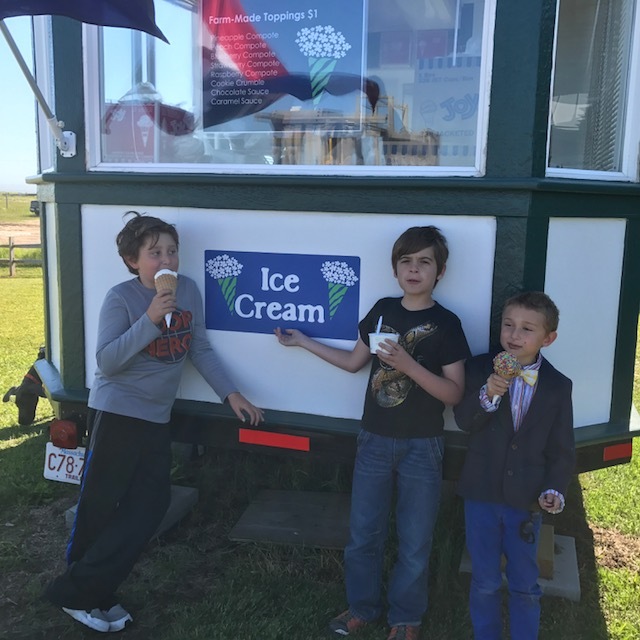 Weeks of rain, clouds, wind and downright chilly weather turned into a string of warm sunny days, beginning on the day we first opened the ice cream truck! Is this an omen for excellent summer weather? Who knows – but we sure hope so! Our new ice cream truck is located just outside the market, near the playground. With a new fenced-in area, this is has the potential to become a favored spot for pre-beach, post-beach, lunch time, anytime! Neil Hudson and his crew are managing the stand and they have developed several farm-made toppings and novelties.